Are closer U.S.-China military ties in Washington’s best interests? I’ve written before that U.S.-China military relations have improved markedly in the past two years, even as the overall relationship has suffered ups and downs. Not everyone is convinced this is a good thing, however. There’s a growing chorus of voices criticizing the U.S.-China military relationship, whether over security or broader strategic concerns. In Forbes’ opinion, the current U.S. military approach of increasing engagement with China in an attempt to forestall incidents is “flawed.” Instead, Forbes argues civilian leadership at the Pentagon should take a stronger hand in guiding U.S. military engagements with China at the strategic level. Accordingly, Forbes called for a review of the Pentagon’s current policies for mil-to-mil engagement with China. Some members of Congress (including Rep. Forbes) also spoke out against China’s inclusion in the U.S.-hosted RIMPAC exercises this year, especially after the PLA sent a ship to spy on the exercises. “It is clear China is not ready to be a responsible partner and that their first trip to RIMPAC should probably be their last,” Forbes said in a statement at the time. In criticizing China for not being a “responsible partner” and for coercive behavior, Forbes and others suggest that the purpose of military-to-military engagement is to change Chinese conduct. In the long term, that is indeed the goal (and China is also actively trying to alter U.S. behavior through military talks). In the short-term, however, mil-to-mil relations are so crucial precisely because of increased frictions between the U.S. and China in the security realm. As the U.S.-China relations move slowly toward a period of entrenched competition, particularly in the Asia-Pacific region, the risk of a crisis in the near-term creeps ever higher. Under these circumstances, regular military talks and engagements become more important. Regardless of their impact on long-term behavior, such talks are essential for stabilizing the relationship in the here and now. For example, U.S.-China military engagements weren’t enough to prevent a dangerous mid-air confrontation between a U.S. P-8 patrol aircraft and a Chinese fight jet in August. Discussions on rules of conduct at air and at sea, though, will be crucial for preventing repeats of that incident – or worse, of the fatal 2001 Hainan EP-3 incident. Rethinking military exchanges because of a near-miss is counter-productive. It should also be noted that the U.S. military engages in plenty of actions that China views as confrontational or aggressive, from close-in surveillance of Chinese coastal regions to regular arms sales to Taiwan. In that past, China would simply cut off mil-to-mil ties as a form of punishment for U.S. actions that went counter to Chinese interests – with no measurable effects on U.S. practices. Forbes is right that increased mil-to-mil engagement has not altered Chinese behavior; decreased engagement, however, is even less likely to do so, as China knows first-hand. The U.S. military shows no intention of altering its current approach toward China. 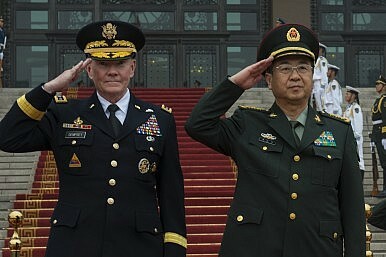 Admiral Harry B. Harris, recently confirmed as the chief of U.S. Pacific Command, said he would follow the policies of his predecessor, Admiral Samuel Locklear, including seeking closer ties with the Chinese military. Adm. Harris told the Wall Street Journal that his approach “won’t differ at all with Adm. Locklear. I support what he is doing completely and I don’t think you’ll see any change.” Adm. Harris also made it clear that he sees North Korea, not China or the various maritime disputes, as the greatest threat to Asia-Pacific security. Despite emphasizing the value of a cooperative military-to-military relationship with China, Adm. Harris wasn’t shy about pointing out areas where the U.S. disagrees with China’s security moves. He criticized China’s unilateral establishment of an air defense identification zone (ADIZ) over the East China Sea as “not the action of a great nation.” Adm. Harris also praised the Philippines for seeking international arbitration over China’s South China Sea claims, despite China’s vocal condemnations of the case. U.S. criticisms of Chinese maneuvers aren’t going anywhere – nor are Chinese complaints about U.S. behavior. But at the same time, U.S.-China military relations will continue to pick up speed, through joint talks, joint exercises, and exchanges. And that’s all to the good. The Diplomatic and Security Dialogue joins economic talks in the dustbin of U.S.-China relations.